Tomorrow will be Simon Busuttil's last day as head of the Malta-EU Information Centre. He has chosen to relinquish the hot seat to return to his legal practice. Contacted yesterday, Dr Busuttil said he did not intend to renew his contract, which expires tomorrow. The information centre will however continue operating under a different head, whose name has not yet been announced. Dr Busuttil has led the EU information campaign since his appointment as head of MIC in May, 1999, drawing repeated attacks and criticism from the Labour Party, which accused him of bias. He always denied the charges. Government-funded MIC has churned out scores of publications, its officials took part in hundreds of television and radio programmes, and they answered thousands of telephone calls providing information on the EU. MIC handled some 1,000 requests per month, but when the referendum campaign went into the critical last stages, the number shot up to a staggering 9,000 in the two months preceding it. In the run-up to the referendum, Malta had one of the most active information campaigns among the 10 acceding countries. So much so, that a recent Eurobarometer survey showed that the Maltese considered themselves among the most well-informed citizens among the candidates. Dr Busuttil said he felt MIC was very effective in ensuring that the electorate took a well-informed decision in the referendum. He said it was essential for MIC to continue operating in the coming years, especially now that EU membership was guaranteed. "Information has to continue pouring in. Unless the government continues providing information, the issue of the EU would backfire," he warned. During a recent news conference, Prime Minister Eddie Fenech Adami said the government was committed to continue providing EU-related information to the public. Dr Busuttil was also a member of Malta's core negotiating group that was responsible for Malta's negotiations with the EU. 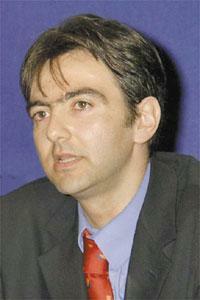 He is also a member of the core group of the Malta-EU Steering and Action Committee which oversees the work of MIC. "It was a very good experience for me, which matured me a lot. But the political sting was way too much and my hair is going grey in the process. So my answer is a definite 'no'."